The second cookie that I included in the Christmas goodie bags was a White Chocolate Chunk & Cherry Cookie. It was a hit, even among the non-chocolate lovers. 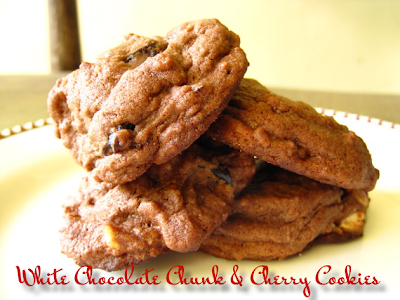 These cookies had unsweetened cocoa powder in the dough as well as white chocolate chips. The chocolate meshed really well with the dried cherries, which made me glad I got this recipe from The Ultimate Cookie Book. "Cocoa drop cookies become the ultimate treat with white chocolate, dried cherries, and chopped pecans stirred into the dough." 1) Preheat oven to 350F. Lightly grease a cookie sheet; set aside. In a medium bowl stir together flour, cocoa powder, baking powder, and salt. Set aside. 2) In a large mixing bowl beat butter with an electric mixer on medium to high speed for 30 seconds. Add sugar. Beat until combined, scraping sides of bowl occasionally. Beat in eggs and vanilla until combined. Beat in as much of the flour mixture as you can with the mixer. Stir in any remaining flour mixture, the white chocolate pieces, chopped pecans, and dried cherries. 3) Drop dough by rounded teaspoons 2 inches apart onto the prepared cookie sheet. Bake for 7 to 9 minutes or until edges are just firm (do not overbake). Transfer cookies to a wire rack and let cool.